Steel crochet hook size 7 (1.65 mm) or size needed for gauge. Gauge swatch: 1.75” (4.5 cm) diameter = doily through round 4. Stitches: Front post single crochet, Front post treble crochet, Split front post single crochet, Split front post double crochet, Split front post treble crochet, Beginning cluster, Cluster, Split cluster, Decrease. 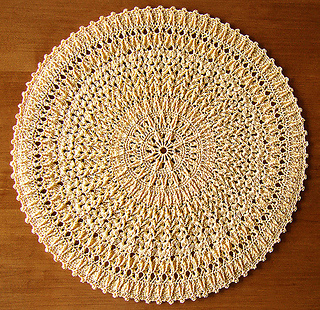 The doily is worked in 27 rounds. There is no stitch pattern diagram for this pattern; all instructions are verbal. The pattern begins on page 12.